There are many applications available which allows you to create documents. However, there one common problem with these applications is the fact that they are compatible with all kinds of operating systems. For example, MS Word is very common word processing software. It can only be used in Windows Operating System. There is a clear lack of flexibility. In order to solve this problem, a new mechanism was launched. It is called PDF, or Portable Document Format. There are numerous applications with the help of which you can create, edit and read PDF files. There are numerous applications with the help of which you can create, edit and read PDF files. PDF files also allow a certain level of security where you can protect the file from unauthorized users by using the password protection option. Though, this allows you to maintain the integrity of the files, it comes with a major disadvantage. You won’t be able to access a password protected PDF file unless you know the password. This is a very common issue with e-books and other documents which you download from the internet. Here comes a PDF password remover into the picture. Why some PDF Files are Password Protected? The feature of password protection is a very crucial one which PDF documents have. This feature has proved to be very useful if you wish to prevent unauthorized users from accessing the file. In a PDF file, passwords can be set on various parameters; like, editing, extracting, copying, printing and etc. How to Remove Password from a PDF File? You would want to protect your PODF files by making them password protected; however, it can be very frustrating if you ever come across such a file. Imagine a scenario where your boss has sent you a report on which you are supposed to act upon immediately in a PDF file. Since the file contains sensitive information, he has made it password protected. But, he has not mentioned the password to you. To make things worse, he is busy in a meeting and you cannot disturb him! Do you have any option? Of course, you do. 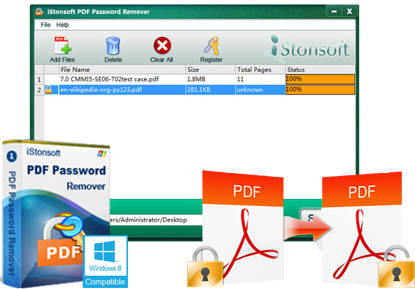 The PDF password remover from iStonsoft can solve your problem. • Opening a particular PDF file. So, if you are wondering how to remove password from PDF files, all you need to do is to visit the official website of iStonsoft and get the software downloaded. • Owner Password: This password is used to prevent other users from making any type of modification to the file. The password remover of iStonsoft can effectively handle both types of passwords. You get this application downloaded for absolutely free from the website of iStonsoft. When we speak about password breakers, we think of high-end applications for which one is required to be highly tech savvy. Well, that is not the case with this particular application. It is very easy to use. It comes with a Graphical User Interface and all you need to do is to follow the instructions which are being displayed. This is how it appears when you open the application. 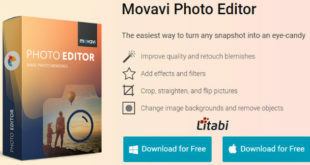 • At first you need to import the PDF file stored on your hard drive to this application. To do this, you need to click on the “Add Files” button on the top left corner of the screen. From there you can get hold of the targeted file. It also allows you to work with multiple files at the same time. • If the file is protected by a “user password”, then you must enter the password. Here is how the screen appears during this phase. • In the final step, you need to click on the start button to remove the password. 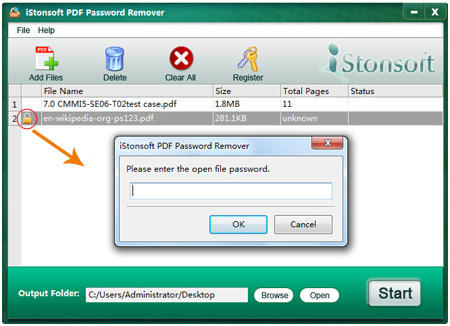 So, in order to open password protected PDF, the best option you have is the iStonsoft PDF Password Remover. It is easy to use and most importantly, it is free. Nice post Nirmala, many times i forget password for old password protected pdf files, i many times used to keep thinking thinking to remember the password on these files, this will be a great relief to open these password protected PDF. Glad you liked the post Mukesh, yes it is very useful software. Keep coming! Nice software, I have few pdf files which is password protected and I tried other software but always failed. Lets try this software and hope for the best. How To Make More Money As A Software Developer? How Is Content Marketing Important For Your SEO Efforts? What is Wifi Amplifier and How Does It Work? GetResponse or Constant Contact – Which one is effective Email Marketing Tool? Host1Plus Review: Why Its Windows VPS Is Worth The Price?